Welcome to AFL Dream Team for season 2012! Despite enjoying just the one game this week, I’m extremely excited to have kicked off the season. The Makers and Breakers are back, and I release my Round 1 Watchlist. Also in there is a DT tribute to the great Jim Stynes and some Bench Tricks for you to consider! Welcome to AFL Dream Team for season 2012! Despite enjoying just the one game this week, I’m extremely excited to have kicked off the season. It’s about time we experienced the fruits of months of pre-season labour! Come to think of it, GWS probably felt the same way, after enduring months of scrutiny and one of the biggest build-ups (along with the Suns last year) a club could possibly withstand. And they weren’t embarrassed in their first official AFL match – not by a long shot. While they did lose by 63 points, anyone who saw the match can attest that the general play was much more closely contested than the final scoreboard suggests. Statistically, they lost almost every category, but they were never embarrassed in any particular player-based stat. The Giants were without earshot in the tackle count (lost by 16) to arguably the best tackling team in the competition in the Swans. They marginally lost the contested possession count (also 16 less) while also competing at stoppages with a 37-43 split in the hit-outs and tying the Swans in terms of clearances. With those key stats in mind, it isn’t hard to be buoyed by the Giants’ performance and to feel cautiously optimistic about their chances for 2012. Of course, for us, this is important. The more competitive the Giants, the more points our Giant rookies (and the odd premium) will collect. GWS weren’t embarrassed in fantasy terms on Saturday night either, going down 1533 to 1716. A loss there was to be expected from an expansion team on debut. Come to think of it, how did this performance rate against the other expansion team to recently enter the league? Pretty bloody good, that’s how. If you remember, the Blues smashed the Suns by a massive 119 points in their Round 2 debut last season. Not only that, they got dominated statistically, losing the head-to-head DT scoring 1304 to 1909. The Suns had 1 ton-up (Rischitelli) to Carlton’s 7. The Giants, meanwhile, actually out-tonned (yes, I know that’s not a real word) the Swans 4 – 2. What can we take from this? Well, keeping in mind that it’s only one game in a long season, I think we can feel optimistic about the Giants fantasy scoring this year, especially if they remain as competitive around the contests as they were last night. 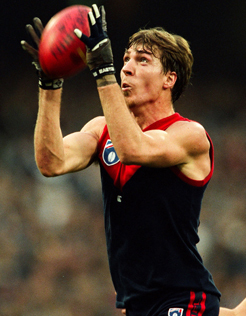 It wouldn’t be right not to mention the passing of AFL great Jim Stynes. While I obviously didn’t know him personally, like much of the general AFL public, it’s clear that he was not only a great footballer, but a great guy. I’ve never seen such passionate, lengthy, heart-felt and wholesome testimonials from so many revered AFL figures. The magnitude of the affect of his passing is still being felt almost a week on and I daresay will be felt by all those in AFL circles for a long time. One of the most prominent themes in the Jim Stynes story is his Irish heritage. These days, it’s common to see an Irish lad or two on a club’s list, with Kennelly, Marty Clarke, O’hAilpin and Hanley all recent examples of successful Irish imports. But we can’t forget that their path into AFL football was pioneered by Stynes, who will now be remembered as a trailblazer and as someone who overcame the greatest adversity to be crowned the League’s Best and Fairest player in 1991, amongst many other personal accolades. Jimmy was also a DT gun in his day, averaging 107.7 in that massive ‘91 season. This is even more impressive when you consider that back then, 80 points would have been considered a big score… So in continuing on with this theme, let’s look at a few players who have emerged from different backgrounds whom you might consider for your 2012 AFL Dream Team. Richmond’s Lebanese pocket-pocket took a big step up last year and boosted his average by 20 points on 2010. He had a hot mid-season patch where he averaged 96 over 13 matches, but tapered off over the last few matches. With Richmond primed to improve across the board, Nahas is a big chance to find a lot more consistency and push his average into the 90’s. With so many legitimate ruck options emerging last year, NicNat has largely (and uncharacteristically) gone unnoticed. A close look at the Fijian-born ruckman’s stats shows that his numbers for disposals, marks, goals and hit-outs have all increased each season over his three years in the league. Improvement at the same rate, coupled with increased ruck time (as evident over the Nab Cup) puts Naitanui in a great position to bump up his average to 85 and beyond. As weird as it sounds, the Tongan is a sneaky chance in the backline mix this year. Obviously, he was dreadful fantasy-wise in defence last year, but a heralded move to the midfield makes K-Hunt an interesting prospect. He will definitely increase his average and his JS is better than, say, Marty Clarke at a very similar price. And his points per minute have been higher! If two of Clarke, Spurr and Morris go unnamed, strongly consider the rugby convert. Real AFL is back – which means so is the Makers and Breakers! It’ll be a little different this week, with only the one game – but it was a hugely fantasy relevant one! So let’s just go with the Top 3 and their reasons for being there. First-gamer Adam Kennedy was the 2nd highest scorer on the field with 116 DT on Saturday night, collecting 28 possessions and 11 marks in a lucrative half-back role. He was absolutely everywhere, linking up for +6’s whilst still collecting 8 contested touches. His DPP status helped him morph into a popular pick (19.1% ownership) and he rewarded those suitors with what will surely culminate in a hefty first price rise. Bugg vs Darley was this year’s Toy vs Coad, until Darley didn’t make the Round 1 squad. That left Bugg as the main GWS rookie defender option, and coaches jumped on accordingly – he’s currently the 5th most selected player at 39% ownership. Bugg played a gritty small defender role, and looked reasonably poised when the onus was put upon him deep in the Giants’ defence. 103 DT points is a great result for those who locked him in. After totalling 41 DT points at 3Q time, Giles finished with a flurry to post 77 valuable DT points. In an encouraging sign for those who went (or currently are) going with a 1-3 ruck structure, Giles didn’t look out of depth or easily overpowered by the man-mountain Mumford. The hit-out count was 26-35 to Mumford in the end, but Giles played significantly less game-time (77% to 91%) due to a head abrasion sustained in the 3rd period. While it was common knowledge that Shiel was coming off only half a game’s match practice, many were sucked into starting him given he was named in the ruck-rover position. Unfortunately, the obvious (how nice is hindsight?) happened and he was subbed out for 36. Shiel finished with 11 disposals and while he looked a little rusty, I have no doubt that after two weeks of uninterrupted training that he’ll be up and firing just as he was in the NEAFL last season. Luke Parker is this year’s Connors – the mid-price-Nab-Cup-hero who ended up red-vested in the very first match of the year. He sustained a huge hit from Old MacDonald midway through the first quarter, which probably convinced the coaching staff to put him in cotton wool early. His 55 came from only 50% TOG, but it will still hurt those coaches who selected him as their midfield mid-pricer after an impressive Nab Cup. 84 DT points is hardly a bad score, but considering Goodesy was the leading choice for the Vice-Captain Loophole, and considering how much more he could have done had he wanted, it was a little disappointing. Goodes seemed to have a touch of the Swanny-Nab-Cup mentality about him, which I’m sure was frustrating for his owners. A classic Round 1 return from a notorious slow starter. With a few GWS rookies surprising us and scoring big in their debut matches for the Giants, you’re probably kicking yourself you didn’t start them on the field. Don’t stress too much though – there’s always a way you can make it count if you really want to, hopefully without compromising your team too much. Here’s my take on three scenarios you might be facing. Many coaches seemed to charge into the first partial lockout with Bugg as their emergency in the backline, with Ellis generally preferred over the Giant rookie. His 103 looks horrible sitting on the bench, so what to do? If Morris isn’t named (which I doubt will happen – he didn’t play VFL this week) then I suggest considering Bock and starting him. Most coaches discounted Bock after learning he is suspended for the season opener, but he’s suddenly an option. He had a solid Nab Cup, displaying the ability to play both ends of the ground – and he would be a great point of difference for your team. Old MacDonald showed he’s still got ‘it’ with a busy 98 thanks to 23 touches and 6 tackles. But did you bench him and click the E? If so, strongly consider Lachie Neale if he isn’t named – we know Lyon loves him and he was best 22 over the pre-season, so he’ll surely see an opportunity early on in the season once that ankle heals. Gibson is the more risky approach, but after collecting 30 touches in the VFL this weekend, he could earn himself an early season spot with another couple of solid games at reserve level. If you had Kennedy as your forward line emergency, this will be the hardest one to manoeuvre into a counting score. The option of picking a forward rookie not named for Round 1 doesn’t excite me at all, so I’m recommending (with a sizable asterix) Dayne Beams. We know he’s all but ruled out for Round 1, but he’ll be back in Round 2 or 3, and we know he can score at will. Still a risky move, and his inflated price is a put-off, but you’d be tapping into a gold mine that no-one else is if it pays off. 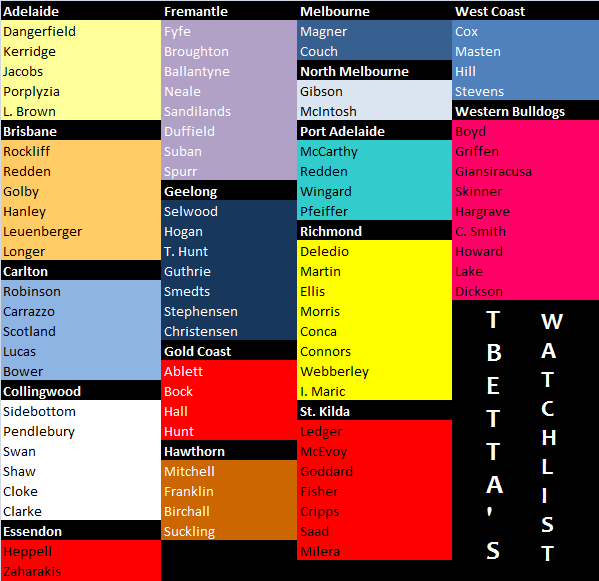 As promised last week, here is my Round 1 Watchlist, not including Sydney or GWS players. It contains all the players that I’m seriously considering if named on Thursday. Take out of it what you will, although I’m more than happy to explain any inclusions or exclusions. This week is the most season-defining week of your 2012 Dream Team campaign, so make sure you take the time to get it right. If you’ve put the miles in over the pre-season you should be fine – back your judgement in and don’t make any knee-jerk calls. A friendly reminder that we have a secondary lockout this week, and that means another bite at the VC loophole (well, not for those that already had a punt on Saturday). Stay tuned for Calvin’s Captains on Wednesday, but strongly consider putting the ‘V’ on any of Deledio, Martin, Gibbs or Murphy; provided you’re okay with starting a player who isn’t named for Round 1. All of the above can be manoeuvred into your midfield, where they can be ‘covered’ by an unnamed Neale or Magner. Well, that’s about it from me. Good luck for the coming week and don’t forget to check out DT Talk regularly – there will be awesome content daily to make sure you go into Round 1 with the best possible side. If you haven’t already, make sure you purchase the DT Cheat Sheet to see the experts’ sides, and get yourself in the running for that massive TV! Guys it’s only the first game. Don’t start making trades and changing your structures just for the sake of 20 or so points. Anyone else on the 5 Premo Mid Strategy to burst out of the blocks? Or is it just me? -Mids are most expensive so one less upgrade to them. -Mids produce best cash cows! I toyed with it earier but not going with it as other positions suffer with the lack of cash. IMO to go 5 premo mids you would have to definately have Giles at R2 and nail all the good rookies and have alot playing. 5 premo mids is unique and jumping out of the blocks puts you up there but you have to have the stamina with trades and cash to sustain the whole season. 5 mid premo’s doesn’t mean you’re going to jump out of the blocks. They average more, but as such cost more, it’s all relative. The best starting teams will be the ones that – as a whole – score higher than the average that they’re priced at. The position each player is in means nothing. That is a Dorothy Dixer if I ever saw one. But fair enough. I have 5 but 2 are dpp backs.. However they won’t stay there..
Where’s Calvin’s Captains??? Imma craving! Did you really need to abrievate can and get? Wouldn’t Porplyzia fall into they”injury prone” category tbetta? Very much so…. but… I want him. I had him a few years back and haven’t been burnt by him like others recently, and he’s very sexily priced. Parker’s 55 is still $27k above his starting price so yeah be disappointed about the red vest but not too concerned no real loss there. Hopefully that will be his basement score for the year (well at least the first half) then upgrade. Tomlinson (What was i thinking?) 54 if he maintains that average could net $123k potentially though from what i did see of him he has a good set of hands and hope he will push to that 60-70 mark. Giles 77 enough said good number 3 spot at that rate up $262k wether he’s held onto or downgraded will have to wait and see. good option to cover buys but after that. Kennedy 116. GUN score. Can he pump it out week in week out? Bugg 97, Cornes 111 Green 99 Old mac 98 Bird 127 Jack 115. I think ppl just get over excited at the start of the year, 10 bucks Tomlinson and shiels will score tons next round and bugg and Kennedy score 50s..
Can I remind everyone last year hibberd was supposed to be playing round 2 and didn’t play till round 7, I will laugh at the ppl who bring in 3 players who don’t get picked round 1 play a game in the 2s and suffer a season ending injury.. I only pick players who are playing round 1 !!! Trust me u will play the wrong rook so much during the year ! Most important part early on is getting cash cows who make you money quick !! Get players playing from the off. 100 on your bench is infinitely better than no 100 at all. The keeper rook you swap out for the dud might nail a ton also and you’ll be mind blown from the start. First post for 2012 … greetings all, best of luck for this season, unless you are in my leagues of course. I bought the Premium Cheat Sheet and downloaded it but it wouldn’t open … any one else having problems?. – I installed foxit, updated adobe reader, I even have a full version of adobe acrobat. All tell me the file is corrupted (and that’s files as I downloaded it a few times to see if I could get a good version). Anyway if no-one else is having problems it is probably something specific to my ISP or virus software. Just throwin this out there, could it be worth me downgrading Pendles to D.Thomas too free up enough cash to upgrade Hargrave to Waters? or would it be better to downgrade M.Clark to someone like Spurr that should give me just enough cash?? Pendles is going to be good this year. Got them both. And upgrade Hargrave? Could be missing out some good cash there? Is waters really worth it? Anyone else having second thoughts about Masten after Parkers low sub-affected score, and to me more importantly the nice high scoring of our rooks again this year. Being Rd 11 also is bad for Masten, so any takers? Parker was unlucky. He was in everything until he got belted by McDonald in the 1st quarter. He was never right after that. Would’ve backed him for 100+ without the hit. Just hoping he hasn’t done any serious damage. Hey, I have a question. I have both Kennedy and Shiel on the bench in my mids (I had thought neither would score well against Sydney – well I was half right sort of), but I named both as emergencies (to be honest I don’t even know why now)). If I pick up someone like Neale or Zorko as a rook (who obviously won’t play this week), how does DT decide which of my emergencies will get the score, is it random, is it alphabetical, is it whichever scores highest? I’ll use this approach if my emergency score is Kennedy’s 116, but I won’t be I’ll be one unhappy little vegemite if I wind up with Shiel’s 30-odd. Anyone know the answer? Oh well, at least I have the satisfication of having him in my side for next round. Would be worse if I dumped him late. Yea I think he could go up massively but Hera about thoses shoulders? I would add Gray, Montagna. S. Byrnes, Vince, Kreuzer. and S. Burgoyne to the watchlist. All are good value imo. durability – not going to top 6 mid – JS – not going to be top 6 mid – mipricer – better options are my reasons for leaving them off, respectively. Spewing about McDonald being offered two matches. AFL is becoming like netball. In fact, you’d probably get away with that in netball. It’s a terrible turn of luck this early on. Maybe he should challenge? If anyone knows how to work the system, it should be him! Means his first price rise wont be until round 5. Gives me an opportunity to get rid of an under performing rookie after two price rises, or a rookie who gets dropped. Ummm….Luke Parker’s injured jaw (will miss up to 3 weeks) would suggest that McDonald DID hit him in the head! do you have a link to prove this news??? the up to 3 weeks part I mean…. add dempsey and watson to the watchlist for essendison. dempsey has killed the pre season and at his price is sure to rise. averaged 72 in 2010 and should go higher than that this year probably into the 80s. Essendison? Sons fan, are we? All good points, but I’m not convinced by Dempsey (think will have to play more accountable in regular season) and Watson has had hammy issues – not for me. Both may have great years, but I don’t see the point on taking the risk on them when I’m more confident in other players. Not to mention Caddy, Lynch (Adel), Ziebell, Hale…or is this is the normal practice on this site where we keep a few ‘specials’ in our back pocket :) by the way the $4 cheat sheet actually cost $5 (with the paypal surcharge, even if you didn’t use paypal) no big deal but a little sneaky. Caddy (midprice), Lynch (midprice/unproven), Ziebell (suspended) and Hale (midprice). Does anyone know when Docherty (BRIS) will return? This may of been mentioned as I tried to read through all of the comments but failed, Tbetta, when i look on the dreamteam website it says Bock is out for three weeks, I was keen on him until I read that last week so I got rid of him, am I wrong? 2 weeks. So you’ll get Bugg 103 (or 97?) this week, then take a chance on a rookie the week after, then Bock will be back. Main attraction is that he’ll be super unique. I think Bock will be one of the top three or so backmen this year, but its difficult to justify leaving $400k+ on the bench for two rounds (particularly when I chose not to tag Bugg with the emergency). What’s everyone’s thoughts on lake? Seems to out of flavor ATM and everyone’s jumping on Hargrave? Damn A.F.L & having a split round now whom/what do I do with R, Griffen? 17,300 left & J Magner only 1 left on my bench. H “Rithcie” Cunningham having already played. Get Jobe Watson in (if you haven’t already). Five Spots left to fill!